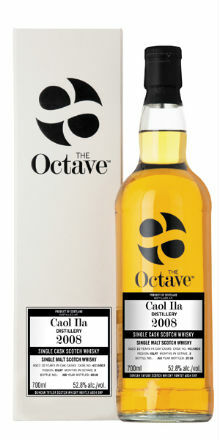 Today, we have a number of samples from the current Octave Collection, a 2008 Miltonduff, a 2007 Macduff, a 2008 Bunnahabhain, a 2003 Highland Park and a 2008 Caol Ila. I tasted each of the above pairs of whiskies, the pre-octave and post-octave samples, side by side, which allowed me to simultaneously compare the liquid before and after it had spent time in the small oloroso sherry cask. Needless to say, for any whisky geek who wants to investigate the intricacies of maturation further, this was a thoroughly absorbing tasting session. Pre-Octave Nose: Nail varnish, lemon scented cleaner, pine, sherbet dibdabs, gooseberry and mint. Post-Octave Nose: Cherry lips sweets, red grapes, blood orange, spiced apricot and polished oak. Pre-Octave Palate: Very light – vanilla, custard creams, marshmallows and slightly metallic. Pre-Octave Finish: Short, with lemon zest and sawdust. Post-Octave Finish: Dairy Milk Fruit & Nut and oak logs. Overall: It stays light, with more ‘red’ notes post-octave, and a move away from simple sweetness and citrus, to a slightly deeper richness. Pre-Octave Nose: Lemon tart, milk chews, copper coins, a touch of sulphur some sweet parsnips. Post-Octave Nose: More rounded, with milk chocolate, red berries, raspberry compote and damp logs. Pre-Octave Palate: White chocolate, panna cotta, ginger/white pepper spice, very creamy with some unripe apples. Post-Octave Palate: Much more tannic – Morello cherries, rum truffles, clove, bark and some dry oaky notes. Pre-Octave Finish: Short, with cake mix and a sweet bready note. Post-Octave Finish: Lingering woodspice and some nutty, chewy oak. Overall: The octave seems to mask the slightly sulphury/metallic thing, and the spice changes from a zesty style to a more earthy, musky note. It really enhances the whisky here I feel. Pre-Octave Nose: Quite creamy, with macadamia nuts, whist chocolate, salted caramel, wet sand, rust and driftwood. Post-Octave Nose: Toasted walnuts, dried cranberries, dark treacle, malt loaf and olive bread. Pre-Octave Palate: Lime, Brazil nuts, gingery spice, vanilla fudge and salted popcorn. Post-Octave Palate: Really very sherried – dates , burnt raisins, cherry, and quite tannic with cinnamon swirls and leather. 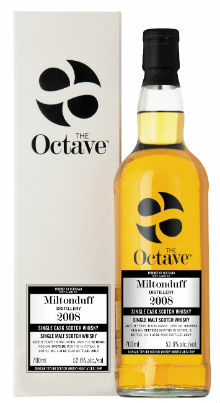 Pre-Octave Finish: Creamy, more fudge and caramel with a lemon zest. Post-Octave Finish: Juicy oak, sultanas and old leather. Overall: This changes a lot after spending time in the octave, more so than the others so far, and it’s all the better for it. A rather simple whisky is given a real backbone here. Pre-Octave Nose: Very soft smoke, some gooseberries, mint, quite herbal, apple scented soap and some blueberry muffins. Post-Octave Nose: Quite similar, to be honest, perhaps some more wood spices which mask the lovely herbal note I found. Pre-Octave Palate: Very clean and coastal. Slate, hessian, more herbal notes, and some tropical things – pineapple and lychee along with a whiff of smoke. Post-Octave Palate: Again, more of the same along with a clove studded ham and some very light sweet BBQ-y notes. Pre-Octave Finish: Light honey, cask stave and faint wood smoke. Post-Octave Finish: Some liquorice, dark chocolate and dunnage warehouse. Overall: This was a very good whisky pre-octave in my opinion, and I’m glad the octave didn’t completely overwhelm the spirit. It added a nice BBQ/baking spice element. Pre-Octave Nose: Some very light smoke, charred wood, Arbroath smokies and a slight medicinal note. Then lobster boxes, limes, pineapple and wet sand. Post-Octave Nose: The smoke becomes BBQ-y, just like the HP previously. Charred steak, a big cinnamon/clove hit and toasted chestnut. Pre-Octave Palate: Smoke up front, then lime, lemon, rock pools, some brine and a little bit of apple skin and pear skin. Post-Octave Palate: Much more savoury with BBQ embers, burnt currants, raisins and some dark chocolate. Pre-Octave Finish: Slightly peppery, with peat smoke and a citrusy zing. Post-Octave Finish: The smoke lingers around longer, with some tobacco leaf and more dark chocolate. Overall: Much like the Highland Park, I rather enjoyed this when it was ‘naked’, but equally enjoyed it when it added some sherried octave clothes. More savoury, slightly more textural and with greater depth. On the whole, this was a very interesting tasting session, and I should mention that the only the post-octave whisky will be available to purchase (I don’t think the pre-octave whiskies are available as a regular consumer product). I thoroughly enjoyed comparing and contrasting each pair of whiskies and teasing apart the influence the octave had on different types of spirit. The rich, juicy oloroso wood can add depth, hide undesirable notes, and lengthen a whisky. The increased wood influence from the small cask adds a nice baking spice element and some slight savoury notes (particularly to smoky whisky). With forty five years of experience in experimenting with octaves, it’s little wonder Duncan Taylor continue to do so. 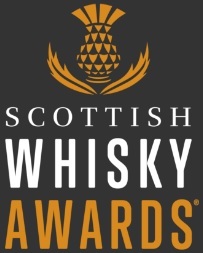 I’d love for them to come out with a little tasting set consisting of pairs of samples – much like they sent me – to allow more people to compare the effect of an octave cask on the ‘naked’ whisky. 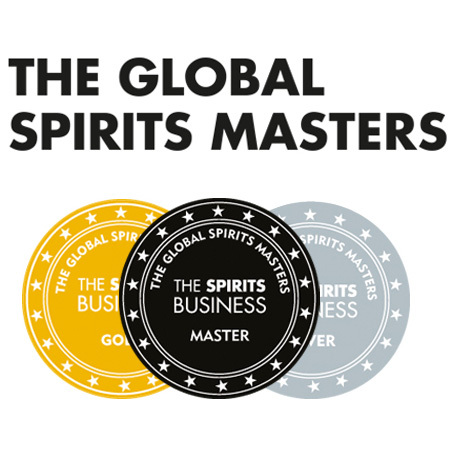 As well as being able to sample some tasty whisky, it’d also be a great educational tool. This entry was posted	on Tuesday, October 16th, 2018 at 9:11 am	and is filed under Reviews. You can follow any responses to this entry through the RSS 2.0 feed. You can leave a response, or trackback from your own site.